Gustav-Hit Houma, La., Sees Little Flooding Houma is one of the coastal Louisiana town that sustained damage during Hurricane Gustav. There, power lines and utility poles are down everywhere and trees are blocking most roads — but the good news is, there is little flooding. Houma is one of the coastal Louisiana town that sustained damage during Hurricane Gustav. There, power lines and utility poles are down everywhere and trees are blocking most roads — but the good news is, there is little flooding. Louisiana is cleaning up after Hurricane Gustav. The major levees held, and there haven't been reports of anywhere near the level of flooding seen after Hurricane Katrina. There is a lot of wind damage, and power is out for 1.4 million households throughout the state. A big question for the nearly two million evacuees, when can we go home? In a moment, we'll talk with one frustrated evacuee in Shreveport. Around New Orleans, the National Guard and state police are manning checkpoints and blocking residents from returning. Today, Louisiana Governor Bobby Jindal saw some of the worst-hit areas from a helicopter. One of those areas is the city of Houma, less than 20 miles from where Gustav made landfall. And NPR's Greg Allen spent the day there. GREG ALLEN: In Houma, people say Hurricane Gustav could have been worse, but that doesn't mean this community got off lightly. On Highway 24, Danny Bergeron(ph) spent the day sitting on the tailgate of his pick-up truck listening to the radio because, really, that's all he could do. Mr. DANNY BERGERON: I'm kind of stranded. I can't go nowhere. I can't flag down an electrical truck to see when they're going to get rid of this. ALLEN: Bergeron's home is surrounded by downed power lines and utility poles, a mass of debris and cables that's trapped him in the house where he took refuge. Only about 110,000 people live in Terrebonne Parish, but officials estimate that as many as a fifth of them stayed here to ride out Hurricane Gustav. Bergeron said he figured he'd be okay because his house stands on high ground. What he wasn't prepared for was the wind. Mr. BERGERON: I said, well, I need to put my truck under the carport. I pull out, I go around the corner so that way I can just drive real quick in. Well, when I drove back in, I got out of my truck, slammed the door, and the top of the pole snapped. A few minutes later, I was out here. The tree falls, and all three poles fall all at the same time. ALLEN: In most of Southern Louisiana, it was the wind, not the water, that did most of the damage. In another part of Houma this morning, Gibb Anselma(ph) was sitting in front of his house with his wife Betty. He says the worst part of the storm was the neighbor's dog, which barked all night long. ALLEN: Winds topped 100 miles per hour here, but even he was surprised how well his house did. As Gustav approached, Anselma says what really worried him was Bayou Terrebonne, which is just at his back door. I asked him how far. Mr. GIBB ANSELMA (Resident): About 100 feet. Mr. ANSELMA: Oh, that's the only thing that worried me at first was the surge from the water, you know, coming in from the Gulf. You're not far from the Gulf of Mexico here, you know. ALLEN: There was little in the way of hurricane protection in this part of coastal Louisiana. 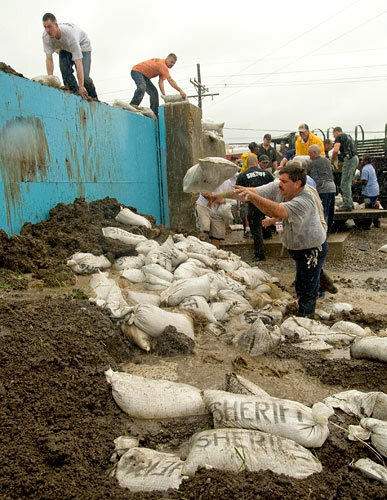 Terrebonne Parish officials feared their minimal eight-foot levees would be quickly overtopped by Gustav's estimated 10 to 15-foot storm surge. Fortunately, those predictions didn't pan out, and authorities here say there was minimal flooding. But all through Houma, trees and utility poles were snapped in half, taking down the parish's entire power grid. In addition, uprooted trees took out water and sewer lines. Terrebonne Parish spokesman Al Levron says officials can't say when residents will be allowed to return. Mr. AL LEVRON (Spokesman, Terrebonne Parish): Without water, without power, our major hospitals cannot operate. Without the hospital operating and the curfew in place, our doctors who relocated cannot come into the community. We need to get out into the community, clean the roads, and ultimately get our people back into a community. Ms. DEE DEE THURSTON (Managing Editor, Houma Courier): What does Barry House(ph) look like? Unidentified Man: Same as everything else, a bunch of trees and a bunch of power lines in the road. Ms. THURSTON: No major roof damage? ALLEN: At the Houma Courier, managing editor Dee Dee Thurston is one of a handful of employees who have been working around the clock since the storm hit. Ms. THURSTON: We're a community newspaper, and I'll probably have answered 200 phone calls and answered twice that many e-mails. I was probably up until about 3:00 this morning doing that. They're all stuck someplace else, and all they want to know is if their house, their mama's house, is okay, and that's what we're trying to tell them. ALLEN: Here in Houma, everyone says the damage from Gustav is worse than what they saw from Hurricanes Katrina and Rita. The closest comparison, parish officials say, is to Hurricane Betsy in 1965, and after that storm, power wasn't restored here for three weeks. Greg Allen, NPR News, Houma, Louisiana. 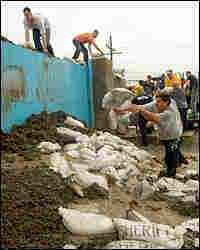 Prisoners and others work on stopping the flooding underneath a floodgate at the St. Bernard Parish and Plaquemines Parish border, Sept. 1, 2008, in the wake of Hurricane Gustav. If a city could breathe a sigh of relief, New Orleans would be doing that now. Bracing for what Mayor Ray Nagin had said would be the "storm of the century," local, state and federal authorities directed one of the nation's largest exoduses, getting some 2 million people along the Gulf Coast out of the path of Hurricane Gustav over the course of 2 1/2 days. Now the task is to get them all home. The city's evacuees are scattered across the country and naturally are eager to return to survey the damage. Nagin has asked them to hold off and stay in shelters and motels for a few more days. He wants officials to fan out and assess the storm's effects first. While the levees and flood walls seem to have done what they needed to do — a far cry from what happened three years ago during Hurricane Katrina — there is other storm damage. The city remains under a mandatory evacuation order and curfew. Power lines are down all over the city, and electricity is out in some 80,000 homes in New Orleans. Some 35 substations are believed to be out of service. The city's sewer system also took a hit. Nagin wants time to fix those problems before residents start back. He said a return home was "only days away, not weeks," and he hoped residents could begin to flow back to the city Wednesday or Thursday. "[At] the latest Thursday we'll start letting our citizens arrive," Nagin told CNN on Tuesday morning. "We're just going to reverse the process; once we give them the word, the same process will get them back," Nagin said, adding that buses, trains and planes would be available to drop off returning residents. "We'll provide them all the assistance they need to get them back efficiently and effectively." Retailers and employers will be allowed to send workers to check on the damage to their establishments Wednesday, the mayor said. "I would not do a thing differently," the mayor said Monday night. "I'd probably call Gustav, instead of the mother of all storms, maybe the mother-in-law or the ugly sister of all storms." Gustav is now a tropical depression moving across Louisiana, with maximum sustained winds near 35 mph, the National Hurricane Center said. That's a far cry from Monday, when Gustav made landfall as a Category 2 storm with sustained winds of 110 mph. Lt. Gen. Robert Van Antwerp, the commanding general of the U.S. Army Corps of Engineers in New Orleans, said Tuesday that the city "dodged a bullet." "The water has gone down in the Industrial Canal considerably," Van Antwerp told NPR's Renee Montagne, referring to the 5.5-mile stretch of water connecting the Mississippi River to Lake Pontchartrain. He said the water is down some 8 to 10 feet from what it was during the height of the storm Monday. Van Antwerp said he was satisfied with the way the levees and flood walls performed, particularly given that the Army Corps of Engineers is only halfway through a six-year reconstruction effort in New Orleans. The levees could never be foolproof and fully protect the city, he said. "I don't use the word protection; I use the word risk reduction," he said. "If this had been a Category 5 with a surge of 15 to 20 feet, there is no way you can protect against that. There are always vulnerabilities." Louisiana Gov. Bobby Jindal said it could be a couple of days before oil and natural gas companies can fully assess Gustav's impact on drilling and refining operations. He said as much as 20 percent of the oil and gas production that was put on hold because of Gustav could be restored by this weekend. In a news release, the Shell Oil Co. said it planned to start redeploying skeleton crews to some of its operations in the Western part of the Gulf of Mexico on Tuesday morning and to some of the eastern rigs later Tuesday afternoon, though those plans are subject to weather and road access, the company said. The Gulf accounts for about a quarter of U.S. domestic oil production and about 15 percent of natural gas output. The concern is that damage to those installations could cause a spike in gasoline prices. Oil prices actually dropped by $4 a barrel, closing at $111 on Monday. Idustry officials say they were prepared for worse and are feeling lucky. "We are breathing a sigh of relief," Shell spokesman Shaun Wiggins told NPR's Carrie Kahn.